I absolutely love getting e-mails from blog readers. It's really meant a lot to me, especially lately, to have people asking for my advice on weight loss, running, binge eating, and lots of other subjects. In responding, I find myself reflecting on what has helped me achieve so much up to this point; I am reminded of how far I have come and discover strengths to help myself work through my own personal roadblocks. Writing replies is then as helpful to the reader as it is to me, and I'm intensely grateful for both these opportunities. Without a doubt, the question I get asked the most is about what diet I followed to lose 150 pounds. The answer is easy, though not necessarily simple: I ate better and I ate less. I tried not to impose any overly strict food rules (I didn't cut out entire food groups or drink only juice - I wanted to make changes I could keep up long-term), but in discovering what works best for me, I've found that I respond better to some foods than others, and avoiding them has proven to be my best approach. Namely, I have a big problem with flour. Bread in all forms, pasta, cereal, baked goods ... these are things I cannot keep in the house. If I do eat them, I have to be careful about it - sandwich rolls were purchased one at a time, pasta is only eaten in Lean Cuisines, and cereal/baked goods are pretty much skipped entirely. I really can't keep quantities of anything, but keeping flour and flour-based products out of the house reduces the damage of a binge drastically. A cookie binge can be thousands of calories. A lettuce binge (yes, it has happened) is a hundred at best. If I have, say, a package of tortillas in the house, I'll try and limit myself to eat one or two with a meal, but inevitably I eat them all. Some days are better than others, but it's something I definitely still struggle with, especially lately. It's a compulsion, an issue I will confront in due time, but for now, it's easier to avoid these foods than try to wrestle with moderation. One issue at a time. Sometimes it is tough. Sometimes I think I want nothing more than a giant bowl of homemade macaroni and cheese - my total comfort food. But I know deep down that what I really want is the comfort, not the food - and especially not the painful feeling of fullness and indigestion that follow. For all the slip-ups and backtracking I've done, I'm very, very proud of the fact that I haven't made macaroni and cheese at all since I started eating better - over 18 months now. Something that has helped incredibly has been finding substitutes and alternatives for ingredients. Sandwiches wrapped in lettuce leaves? Delicious! Spaghetti squash and shredded zucchini? Wonderful! And for my sweet tooth, I try to mostly stick to plain ol' delicious fruit (really on a strong pear kick lately), but sometimes, I make a little treat: dessert hummus. I made it for the first time about a year ago, and fell in love. It had the delicious consistency of cookie dough without the flour or refined sugar, plus fiber and protein from the chickpeas and peanut butter. Since peanut butter is another one of my problem foods, though, I haven't made it in quite a while. I also stopped because the bulk bins at my local grocery store don't have chocolate chips in them like they did at the Whole Foods back in Chicago - again, quantities. I don't want to buy a whole bag of chips for one little recipe. I liked being able to buy just a few tablespoons as needed. So, again, easier to just go without. This past week, though, I was really craving sweet hummus, and decided to experiment with what I had in the kitchen. Instead of peanut butter, I used a medium-sized very ripe banana, and a tablespoon of cinnamon. 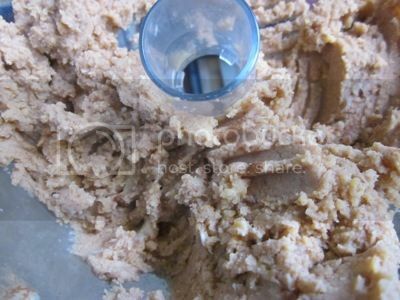 I added those into my food processor with a can of chickpeas I had drained and rinsed, and processed it all into a paste. Looks strange, but tastes delicious - trust me. I searched the Internet afterwards to see if I was the only one who'd ever tried it (not for the thrill of being an inventor, but more for validation that I wasn't eating something weird), and I found quite a few banana hummus recipes. Most of the ones I found, though, involved peanut butter as well. I wish I had taken a better picture. Or even took it out of the food processor. I just ate it with a spoon, straight from the mixer. Unlike with the other non-savory hummus recipe, I did not peel the chickpeas - I wish it was intentional, but really, it was me being lazy. But it worked out really well, I think, because the consistency was less like a dip and more like a cookie dough. Just what I wanted! A bit higher than my usual greek yogurt and piece of fruit, but it was very, very filling. Next time, I will only eat half, but have it with apple slices. I'd also like to try it with PB2 instead of cinnamon - I finally ordered some, and am excited to try it! What about you? Have you ever tried a dessert/non-savory hummus? If you're a PB2 fan, how do you enjoy it best? Personally, I'm looking forward to mixing it in with my morning yogurt - always a plain Fage greek yogurt. I'm a huge fan of PP2! When I get a lil' sick of my morning oatmeal (which is my FAVORITE breakfast food at the moment) I mix it in to freshen it up. love love love it. That looks really good. I may be trying that when I get some really ripe bananas! Maybe I can trick the kids into eating it. LOL. I havent tried to make hummus before. But I love it. Thanks for posting! HI Mary, just found your blog via Karla's blogroll. Congratulations on ALL your success to date!!! I look forward to reading your previous posts, and reading those going forward. Have a great Sunday. PB2 should work great in this recipe because it has a bit of sweetness. Unfortunately, that's the reason I really don't like it as a substitute for peanut butter. I prefer the peanut butter made of peanuts and salt only. I still haven't had PB2. This banana hummus looks very interesting, I may have to give it a whirl. I love how you relate to your readers and answer questions. Your openness about your journey is inspiring. I really really really REALLY want to try this!!! Yum... I will have to try this! I agree with the others this looks amazing! so brave to try something like this and it obviously paid off!! Will be trying this sometime soon!! What a great idea! I love making hummus from scratch. Never would have thought of this. Dessert hummus sounds so weird, but if it's anything like cookie dough... I'll probably have to try it. Banana hummus?! I don't know if I find this weird or wonderful! I will give this a go. I think everyone knows how I feel about PB2! ;) I love the cookie dough hummus, so maybe I'll try this banana hummus. It's a great idea to buy in bulk just the amount that you need of chocolate chips (or other things as well). I have a problem with quantity, too.